Tom Tom has launched an offline navigation App for India which will store all navigation maps on your device so that you can access them even without internet connection, which can be very helpful in case of calamities or network failure. This App can provide you with navigation based on GPS hardware. 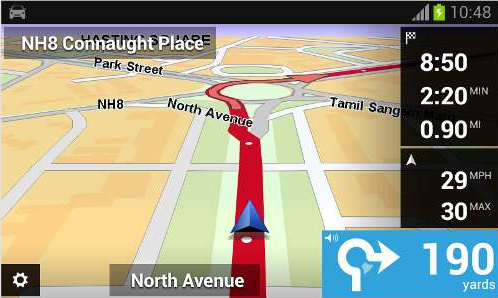 The Tom Tom Navigation App can be downloaded only on Android devices from Google play store for Rs. 2050. The amount of 2050 INR is a once in a life time subscription fee and you will get 4 free updates every year. The app also promises to deliver most accurate and reliable arrival times at all times of day along with availability of latest maps. It comes with Multi tasking support which implies that it will ensure proper guidance even when you are making Phone calls from your smartphone. Its Advanced Lane Guidance feature provides with extra clarity for complex junctions. You can also opt for voice instructions while navigating, thus keeping your eyes on road. This App requires 960 MB of free space on your SD card. It will store maps to your SD card by default. Another requirement is a resolution in the range WVGA (800 X 480) and Full HD (1920 X1080). Also the Android version on your smartphone should be Android 2.2 or higher.